The Environmental Working Group just released the 2019 “Dirty Dozen.” Are your favorite veggies and fruit, like kale or strawberries, on the list? 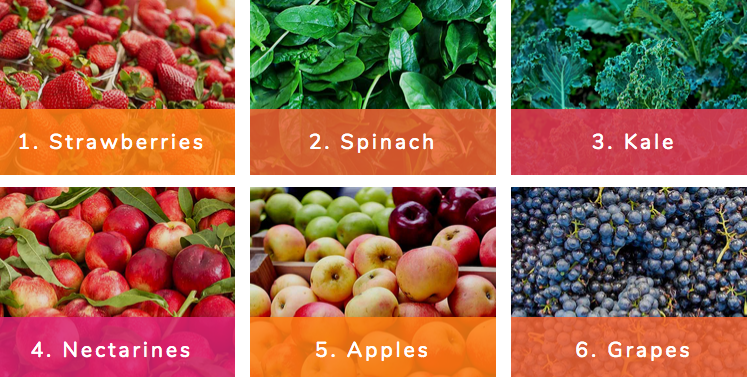 Strawberries continued to top the “Dirty Dozen” list, followed by spinach, kale, nectarines, apples and grapes. More than 90% of samples of strawberries, apples, cherries, spinach, nectarines and kale tested positive for residues of two or more pesticides, the EWG said. Test data from the U.S. Department of Agriculture showed almost 70% of produce sold in the U.S. contains pesticide residues, according to its analysis. The group also released its annual “Clean Fifteen” list of fresh produce with fewer detected pesticide residues. The 2019 list, in order, includes: avocados, sweet corn, pineapples, frozen sweet peas, onions, papayas, eggplants, asparagus, kiwis, cabbages, cauliflower, cantaloupes, broccoli, mushrooms and honeydew melons. The latest list is similar to last year’s with a slightly different order — and mushrooms were added this year, replacing mangoes. If you love kale and strawberries, like we do, here’s what you should do. 1. Buy organic, when possible. 2. Wash your produce thoroughly before eating it and 3. Continue eating a wide variety of produce, even those on the EWG’s list, as the health benefits associated with eating fruits and veggies. Here’s how you can spring clean your diet with produce.